The US dollar saw quite a rally in the last 24 hours. 1. Investors are beginning to take the US labor markets improvements more seriously. The trend in falling initial jobless claims looks more sustainable now, which bodes well for GDP growth expectations. 2. Related to #1, some of the senior Fed officials are growing uneasy about the bond buying program. Reuters: - "I'd like to stop but I would particularly like to see us begin to slow the pace down, gradually ease our way out of this if we possibly can," Philadelphia Fed President Charles Plosser said on Bloomberg television, answering a question about an exit from the Fed's monetary easing. 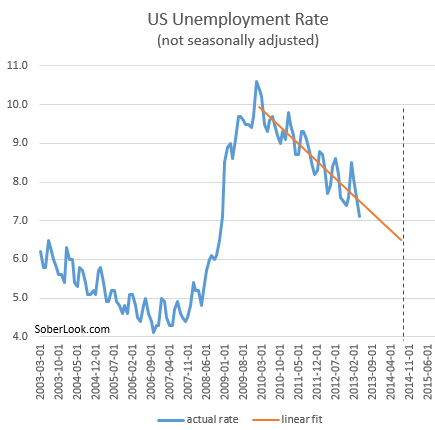 Currently it is projected that the US unemployment rate will hit 6.5% some time in late 2014 (chart below). That's around $1.5 trillion of additional securities purchases. Clearly some are becoming concerned about this massive incremental stimulus target. Any deviation from the expected prolonged securities buying program helps the US dollar by raising rate expectations. At the same time other currencies are facing challenges and lower rates (3-6 below). 3. JPY: As discussed, Japan's government is politically motivated to push the yen lower. 4. AUD: Per earlier prediction (see post), Australia's central bank indeed cut rates to the lowest level in the bank's history, pushing the Australian dollar lower. WSJ: - The weakening trend in the Aussie, as the currency is known, accelerated earlier this week after the Reserve Bank of Australia cut its benchmark lending rate by a quarter percentage point, taking some investors by surprise. Economists are increasingly worried that Australia's strong ties to China will become a vulnerability as the Asian economy slows, reducing demand for Australia's mining exports. "The Aussie was a darling of the market, and now has fallen out of favor," said Marc Chandler, a currencies analyst at Brown Brothers Harriman. 5. EUR: With "austerity" becoming a dirty word in Europe, some are concerned about budget deficits rising in the periphery. This has dampened recent enthusiasm for the euro. InsideFutures: - The Euro slipped to a fresh monthly low of 1.2976 ahead of the G-7 meeting as European policy makers continued to scale back their push for austerity, and the single currency may ultimately give back the rebound from April (1.2743) as the fundamental outlook for the region remains clouded with high uncertainty. 6. CAD: And finally there is the Canadian dollar. As discussed before (see post), Canada's economic growth has slowed, putting some downward pressure on the nation's currency. BW: - Canada is expanding at the slowest pace since 2009 as the prices of exports such as oil and gold collapse and consumers cut spending. The Bank of Canada last month cut its growth outlook for this year to 1.5 percent from 2 percent because of lower business investment and government spending. Canada’s dollar dropped the most in three weeks against its U.S. counterpart after employers added fewer jobs than forecast in April, adding to concern the nation’s economic recovery is slowing. This combination of improved expectations for the US economy and lower rate expectations in other nations has propelled the US dollar higher.